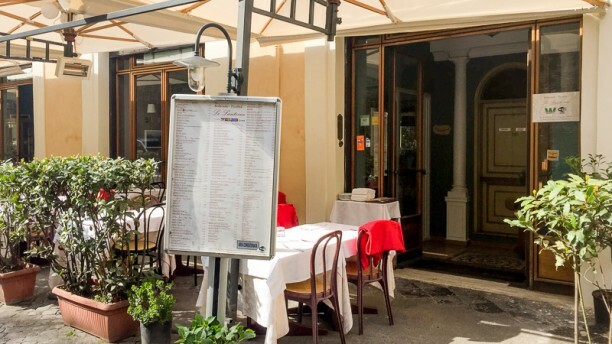 ACCOGLIENZA - Nel centro di Roma, nelle immediate vicinanze dei Giardini di Montecavallo, sorge il Ristorante Le Lanterne. Si tratta di un ambiente arredato con cura dei particolari e sobria eleganza, dove lo staff di sala offre un servizio puntuale e preciso. La struttura dispone anche di un dehor esterno, perfetto per la stagione estiva. PROPOSTA ENOGASTRONOMICA - Il locale propone un menù tipicamente mediterraneo accanto ad una carta dei vini ricca di etichette selezionate apposta per soddisfare tutti i palati. Molto buona anche la pizza proposta. DESSERT - Per concludere con dolcezza i pasti, sono disponibili deliziosi dolci fatti in casa, come ad esempio il tiramisù e la panna cotta al caramello. Even thoughthe booking for our group of 8 had not been received the staff could not have been more accommodating in making arrangements to fit us all in. When 5 extra friends also arrived the staff went to great lengths to seat them together with us. We can highly recommended this restaurant. The location allows for people watching and a cool breeze in the summer. The food was excellent and reasonably priced. We had a wonderful time. Thank you for your hospitality ???? Probably best NOT to book using The Fork booking service. Although we had email confirmation of our reservation we were told by the surly owner that he didn’t have our booking, that online bookings don’t work, and that we should have rung to secure a booking. He did manage to squeeze us in to a corner table, but made me feel embarrassed and uncomfortable in front of our friends. Food was fine but not his attitude. Wouldn’t rush back. The food was amazing but portions are very small for the price. Considering it's somewhat difficult to find and easily out of the way from the larger attractions, I thought the portions would have been larger. We've eaten at restaurants close to the Vatican that offered much larger portions for the same price. We left hungry. The service was decent. Nothing spectacular that made you feel welcomed but it got the job done I suppose. Great service, atmosphere, mist outside was perfect with the hot Rome weather! Very positive experience, but the service was slower than expected.